The Greater Huntsville Section is one of the largest Sections in AIAA with over 1,300 professional, student and educator associate members across the states of Alabama and Mississippi. The Section conducts regular activities spanning the continuing education, professional development, pre-college outreach, public policy, college student and technical functional areas. Activities range from technical skills development classes, lectures, and industry and history tours to networking, public policy and Science, Technology, Engineering and Math (STEM) outreach events. The Section supports STEM scholarships, science fair and engineering design competitions. Greater Huntsville organizes and conducts Engineers Week activities as well as local and national public policy events to promote the aerospace industry and engineering profession. 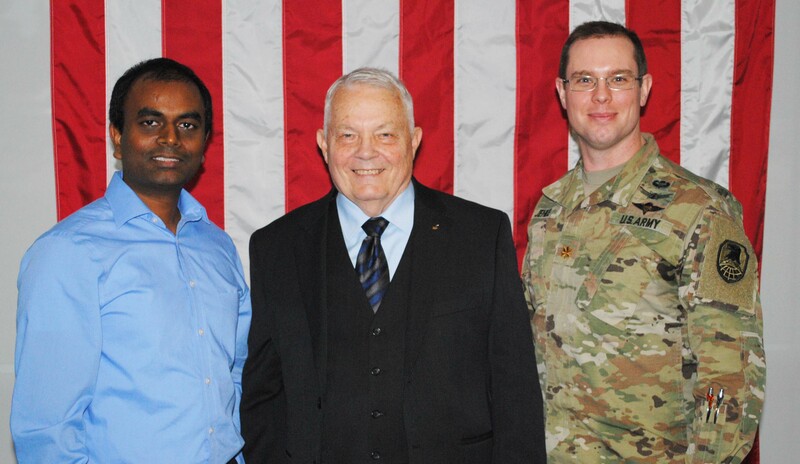 Chairman Dr. Naveen Vetcha, BG Robert L Stewart (USA ret. ), and Vice-Chairman MAJ Alex Jehle after Section Luncheon. The general membership meets monthly with distinguished speakers on topics related to aeronautics and astronautics such as aviation history, science, engineering, defense programs, propulsion, and human space flight. For more information on the Greater Huntsville Section, please peruse the rest of this website. Like us on Facebook at https://www.facebook.com/GreaterHSV.AIAA or Follow us on Twitter @AIAAHuntsville. Check our Events calendar for upcoming events and activities.